Most people now realise that climate change is happening, that it is caused by human emissions, and that it is dangerous for future generations, especially in developing countries. But many of us don't have much idea of the detail. What exactly is going to happen later this century? In the following account I focus on the likely future consequences of climate change for human beings including our children and grandchildren. The human consequences cannot be separated from the current consequences of an unfair global economic system, so I will start by addressing that. Poverty makes people more vulnerable to climate change, and the effects of climate change will be more serious in tropical countries. The main cost of climate change will be measured in human lives (i.e. premature deaths); that overlaps with the main cost of poverty, which is measured in the same way. My main source material can be found at ipcc.ch. The reports of the Intergovernmental Panel on Climate Change are prepared by hundreds of internationally leading climate scientists. The main texts are subject to quality control at the highest level and involve large numbers of anonymous expert peer reviews. The authors of the IPCC reports are no more or less biased than other researchers; they have no particular reason to present an overly optimistic or pessimistic account. My text is about what will happen if the predictions of the IPCC come true, which they almost certainly will. In spite of the complexity of the predictions, they are ultimately based on the "exact science" of classical physics and Newton's laws of motion. It is notoriously difficult to predict the future of society and politics, but relatively easy to predict future developments in the physical world. Every year right now, some 60 million people die in the world, for any reason. Of those, some 10 million die prematurely in developing countries in connection with poverty; the direct causes include hunger, curable/preventable disease, and violence. Seen in this way, poverty is the cause of one in six deaths. Most of the deaths due to poverty are happening in developing countries; within these countries most deaths are due to poverty. The numbers depend on how you define poverty; according to philosopher Thomas Pogger, 1/3 of all premature deaths are due to poverty. It is a truism to say that poverty is a matter of life and death. These figures are comparable with the death rate due to violence and hunger during the Second World War (WW2), which killed some 60 million people in about 6 years, or 10 million per year on average. That observation flies in the face of feel-good claims by Steven Pinker and others that things are generally getting better. Moreover, even if Pinker and friends were right, we might merely be experiencing the calm before the next storm. It is a statistical truism that periods of "calm" are generally followed by periods of "storm", and vice-versa. In 2006, it seemed that global financial crises were going out of fashion; the crisis of 2007/08 was a total surprise to most economists. The death rate in connection with poverty has been gradually falling for decades, and it is still falling now. One is tempted to congratulate oneself and turn one's attention to other things. But 10 million deaths per year is still much higher than anyone could possibly consider "acceptable" or "inevitable". Moreover, this death rate would be much lower by now if the rich countries had taken the problem seriously for the past two decades, supporting existing projects to tackle the well-known causes with political will and sufficient finance. Not only that - in coming decades, climate change will gradually push this death rate up again. The progress achieved in recent decades will be lost. Toward the end of the century, the global mean temperature relative to the 18th century will approach 3° or even 4° Celsius. That is likely, given the poor track record of the international community to address climate change so far, and the many inadequacies of the 2015 Paris agreement. The death rate in connection with poverty could then easily approach 20 million per year (detailed reasons are listed below). Of those 20 million deaths, some one in two will be attibutable to climate change. These numbers are only order-of-magnitude estimates, but they are sufficient for the purpose of argument. Essentially I am saying that these death rates are far higher than "acceptable" (whatever that might mean) and they are certainly not "inevitable". The activities of the rich countries are the main cause of the problem. We are responsible for it, so we must solve it. The killing in WW2 (including the Holocaust) was deliberate, but deaths from poverty and climate change are not deliberate. They are (and will be) the result of a failure to rescue people in danger. The philosophical-ethical literature on the "trolley problem" suggests indirectly that it is about five times worse to kill someone than to allow someone to die whom you could reasonably have saved. Opinions differ considerably on this ratio. World population is growing. At the time of WW2 it was about 2 billion; now it is about 7. Relative to the smaller world population at that time, WW2 was 3 or 4 times more serious. WW2 lasted six years. The projected durations of the current global hunger crisis and the future global warming crisis are much longer. Order-of-magnitude estimate: they will last 10 to 100 times as long. In fact, the effects of anthropogenic climate change will be felt for millennia. The final death toll will be much bigger. We cannot change what happened in the past, and we can hardly change what is happening right now, but we can certainly change what will happen the future. That makes current and future threats more important than past threats. Put another way, the deaths from poverty are really happening now, and future deaths from climate change will happen with a high probability, but the probability of a WW3 (comparable to WW2, or worse) is much lower. These factors act in opposite directions. The first two suggest that WW2 was worse than current and future problems, and the second two suggest current and future problems are worse than WW2. We can hardly evaluate these effects relative to each other, so in a first approximation we might suppose that they cancel each other out. to sustainably and significantly reduce greenhouse gas emissions in coming years, aiming for zero net emissions in a few decades. These three points are about equally important, and they are much more important than anything else. They should be the main issues in any national election campaign in any country. From a human rights perspective, local issues can only be more important if a large proportion of the country is seriously threatened with premature death for other reasons, which is indeed true in some developing countries. In industrial countries, there is no excuse for ignoring these issues in election campaigns, but that is what regularly happens: all three issues are ignored and attention is entirely focussed on smaller local issues. I am not a pessimist. On the contrary, I am writing this because I believe that humanity can still solve these problems. But we can only solve them if we are honest about them. The apparent pessimism of "alarmists" like me may turn out to be the key to human survival. Perhaps our greatest threat is from influential optimists and resultant public indifference. It follows that if we love our children, we need to get realistic (even if realism seems pessimistic) and put some serious work into solving this problem. A long-term reduction in the global preventable death rate is indeed possible, and the aim of this text is to achieve that. But it would be unrealistic to claim that we are achieving that in the current global political environment, in which the wealth gap (or income inequality) is inexorably rising, and democratically elected governments seem powerless to stop the process. A possible solution to that problem is globally harmonized wealther taxes, but I digress. in some tropical countries, unprecedented temperature-humidity combinations will exceed the human ability to self-regulate body temperature (wet-bulb temperatures exceeding 35°C), leading to mass death. loss of biodiversity (species extinction) on both land and sea. the emergence of new diseases. The likely causes of death include mass murder. Extreme-right governments in rich countries may resort to killing millions of climate refugees on their borders, claiming that they have no alternative, and blaming past generations who were well informed about global warming but failed to prevent it. Early signs of this future development can be found in current discussions of migration, refugees and asylum. Currently about 2.6 billion people — two thirds of them women — live in poverty (below $2 a day) with almost 1 billion living in extreme poverty (less than $1 a day). (...) Every year climate change leaves over 300,000 people dead, 325 million people seriously affected, and economic losses of US$125 billion. Four billion people are vulnerable, and 500 million people are at extreme risk. (…) By the year 2030, the lives of 660 million people are expected to be seriously affected, either by natural disasters caused climate change or through gradual environmental degradation. (...) Over 900 million are chronically hungry today—many of them due to climate change. (…) It is estimated that 135 million people — the combined populations of France and Germany — are at risk of being displaced by desertification. (…) By 2030, hundreds of millions of people are expected to be hit by deteriorating water quality and availability due to climate change. (…) Almost 160 million people currently living in low lying areas are believed to be at risk of flooding from storm surges. (…) The IPCC and the Stern review speak of 150 million and 200 million permanently displaced due to rising sea-levels, floods and droughts in 2050. (…) The World Bank estimates that sea levels rising a single meter would displace 56 million people in 84 developing countries. (...) Bangladesh is highly exposed to both disasters and sea level rise. Of its 155 million inhabitants, half live below the poverty line and over a third suffers from malnutrition and hunger. A Bangladeshi rights group estimates that some 30 million people in Bangladesh are already exposed to climate change through extreme weather, rising sea levels and river erosion. On the Wikipedia page "Climate Change and Agriculture" I read the following on 22 Dec 2014: "The IPCC Fourth Assessment Report also describes the impact of climate change on food security. ... For reference, the Food and Agriculture Organization has estimated that in 2006, the number of people undernourished globally was 820 million. Three scenarios without climate change (SRES A1, B1, B2) projected 100-130 million undernourished by the year 2080, while another scenario without climate change (SRES A2) projected 770 million undernourished. // Including climate change, three scenarios (SRES A1, B1, B2) projected 100-380 million undernourished by the year 2080, while another scenario with climate change (SRES A2) projected 740-1,300 million undernourished." These assessments appear overly optimistic. 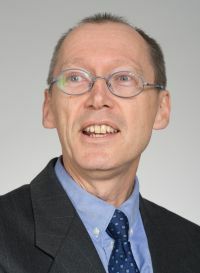 They can hardly take into account the long list of uncertainties, which includes effects of water-supply conflicts on food security, effects of mass migration away from areas with rising sea levels, general reductions in available seafood for a range of reasons, and unpredictable ecological interactions when a given combination of species becomes extinct. There are a lot of climate deniers in the background of Wikipedia, constantly trying to distort the truth, and even without climate deniers, the rich countries can hardly be expected to be objective about this question, since the problem is their fault. The following graph is no more than a rough sketch, but it illustrates the magnitude of the problem. It is a scenario for the development of the poverty-related death rate during the 21st century. Consider the two straight lines that look like an open jaw. The lower line assumes that, in the absence of global warming, the current death rate will gradually fall, mainly as a result of official developmental assistance and major projects such as the Sustainable Development Goals, but also as global markets are better regulated and competition becomes freer and more fair. This is a rather optimistic assessment based on current trends. The upper line is based on the above-listed predicted causes of death in developing countries, along with IPCC prediction that global mean temperatures will probably rise by about 3°C during the 21st century. If that happens, the negative effects of climate change will overtake the positive effects of developmental assistance and fairer participation of developing countries in free markets. How fast will the death rate increase? I have made a rather conservative estimate of about 1% per year, 10% per decade, 100% per century (there is no need for sophisticated mathematics since these are very rough estimates). I am assuming for the purpose of argument that the total death rate will increase steadily from 10 million per year now to 20 million one century from now. The violet area between the two lines is the total number of deaths that will be attributable to climate change during the 21st century. It corresponds to hundreds of millions of deaths. We are causing these future deaths now with our carbon and methane emissions, deforestation and so on. Depending on how the numbers are estimated, the area of the violet part of the graph corresponds to between 500 million and one billion deaths due to climate change, spread out over a century. The rate of preventable deaths in developing countries is currently roughly 10 million per year. In the absence of climate change, this number will gradually fall, mainly due to constructive collaboration between rich and poor countries, funded by official developmental assistance. Climate change will probably cause this number to rise instead. The lines are not necessarily straight; in fact, the upper line should be curved, because the effect of climate change is expected to increase exponentially and not linearly. Perhaps I should replace the graph to make that clear. But it might also be misleading, because the amount of curvature is very hard to predict. Even with all this uncertainty, the very real prospects of this sketch becoming reality are nothing less than terrifying. We are talking about causing hundreds of millions of deaths with our greenhouse gas emissions. Even if the climate deniers were right and this will only happen with a small probability, say 10%, we are still effectively talking about tens of millions of preventable deaths. Conversely, if the IPCC is underestimating the scale of the problem (for example by neglecting interactions between different factors, or by not being not interdisciplinary enough) then we could be talking about billions of preventable deaths. the release of ancient methane deposits. Following climatic "tipping points", these "positive feedback processes" may lead to "runaway climate change" and even human extinction. The implications are so enormous that we can hardly imagine them, let alone respond adequately. To get a grip on this problem, we need to turn it around and look at it from different perspectives. One idea is to apply a variant of the Golden Rule to this situation. How would we feel now if people in the 18th century had irreversibly changed our climate and we were dealing with the consequences right now? If the problem had gradually become worse during the 19th and 20th centuries? If global temperature had now risen by 8°C (as it might really do by 2150 or 2200) and was still rising due to positive climatic change feedback, even though human emissions had completely stopped decades ago? 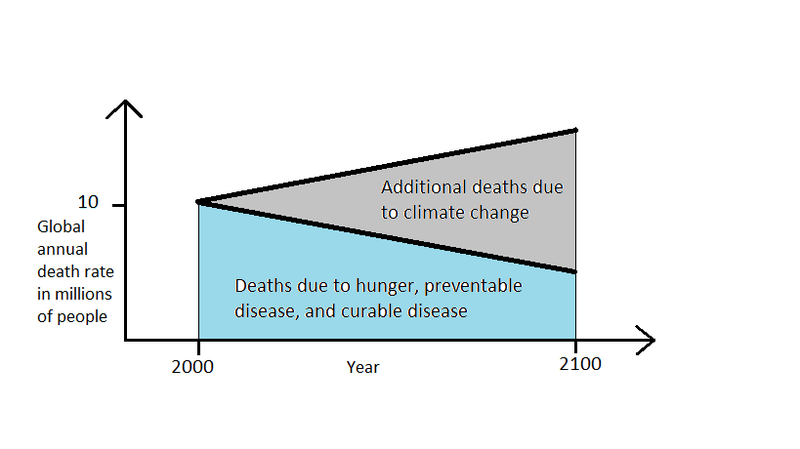 If recent decades had seen the highest death tolls ever from hunger and disease, peaking at 100 million per year (10 times the real current rate) - mainly due to anthropogenic climate change? If hunger and disease had reduced world population by half? If tens of millions were still dying yearly, in spite of massive investment in international aid? If most people now lived where Canada and Russia used to be (before the climate wars), while the tropics - West Africa, East Africa, the Middle East, India, South-East Asia, Central America, the northern part of South America - were devastated? If Northern Europe was particularly crowded because the Gulf Stream had stopped, reducing temperatures? If most rainforests, including the Amazon and most of its traditional peoples and its biodiversity, had been destroyed in forest fires? And the situation was completely irreversible? How would you feel if those 18th-century people had been fully informed of the likely consequences of their actions, but had pretended not to know and had just kept on emitting? Some people will read the previous paragraph and think it is either science fiction or totally exaggerated - as if I was either quite hysterical or a member of the denial-distortion-deception gang. I am neither of those things. I am a scientist. I have a lot of experience working with uncertain probabilities and rough estimates. I have a lot of experience with peer-review procedures that are supposed to solve problems of distortion and deception, and usually do. Of course it is important to tell an exciting story, otherwise no-one will read your work. Scientific writing should not be boring. But the previous paragraph is not especially exaggerated. It is a possible outcome of global warming, as predicted by today's best climate science. The probability of such an outcome may not be particularly high, but it is not particularly low, either. I have simply tried to project what will happen, based on what we know from today's science and the long history of natural climate change on this planet, namely the latest IPCC report. The IPCC is not predicting the extinction of the human species, but they are certainly predicting the destruction of many of the beautiful things about Planet Earth that we take for granted today - things that our descendants will sorely miss in the future. And yes, our descendents will surely hold us posthumously responsible for our actions, or our failure to act. The implications are clear. All greenhouse emissions must be stopped as soon as possible, which means over the next few YEARS. Current international plans to stop greenhouse emissions over the next few DECADES are comparable with sentencing hundreds of millions of people to premature death (which incidentally is why it is relevant to talk about human rights and the death penalty in this context). The people doing this "sentencing" are living in the rich countries, and we are dominated by the mega-rich within those countries. The people receiving the "sentence" are living in the poor countries and they are dominated by the poor within those countries. That is how bad things have become, and many of us are still pretending it isn't happening. The bottom line is that human lives are more important than money. If humanity doesn't realise that soon, all that wonderful progress we made in the last few centuries, based on the scientific revolution and the enlightenment, will have been for nothing. We are now using technology to destroy ourselves, and we are not yet enlightened enough to realise it.